When you removed the rubber bands, did you wait till the paint was dry? Yup! I waited about 6 hours and they were nice and dry and just popped the rubber bands off. For a less-mess method using scissors to cut them off might work. Can I do these with gold spray paint? Love this idea for my wedding. Thank you!! These look like something I’d find at Pier 1. I LOVE that store. These are so classy looking! I’m hosting a Winter Wonderland link party on Monday and would love it if you stop by and link these up! I’m a Pier 1 addict too! I’ll definitely stop by your blog for the link party next week, I can’t wait to see what everyone else is making. Very pretty 🙂 Cant wait to see what you did with the apothecary jar! Wow. Really pretty. Thanks for sharing. Do you have to use just white paint? Or will any colour work too? I know I’ve seen other people use frosted spray paint and they made a nice effect so I think you can switch up the colors. You probably want to stay light and thin with your paint to help make sure the light shines through but I can see a soft aqua glow or a few other shades looking really nice. Will the paint get too hot? I didn’t like the look or mess of the rubber bands when I did it, I’m making 20 for my wedding in August So what I did is first warped around twine string in a thick random pattern then painted with white paint/primer combo. I then stripped off the twine, no or at least limited paint flakes is sweet! I wiped it down, then I wrapped thin nylon string about a inch apart over the whole thing keeping then as even as possible. I then painted the string and let dry. Looks awesome, can’t wait for the wedding. I just hope the paint doesn’t get too hot. Maybe I should have used some kind of high heat paint, but the kind I bought was made for glass and I could see the other flaking off… maybe I worry too much. I like the idea of twine. The paint hasn’t had any problems for me since I just painted the outside. I have let them run several evenings and everything has gone well. Just make sure you’re using strong glass. 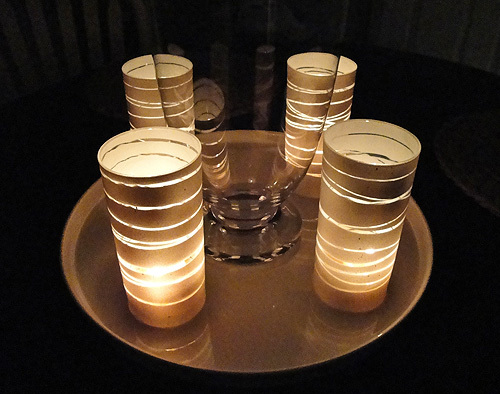 If you’re really worried, try a smaller candle and put someone on candle duty to check every hour or so to see if candles need to be replaced or rested. Good luck on the wedding! Sounds great! Thank you for the feature! So pretty, and it seems so easy to do (although we’ll see once we try!) Thanks so much for sharing! I love this so much! 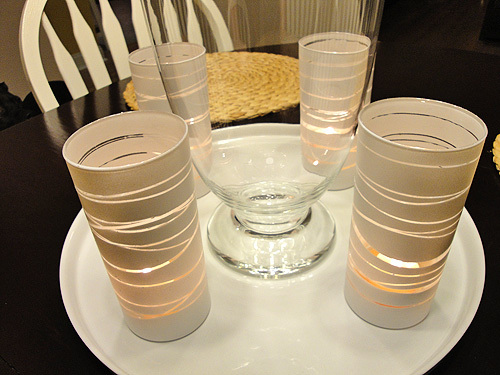 I’m collecting tutorials for budget-friendly vases and candle holders. This is going high on the list. So high that I’m going to feature it on my Be Inspired blog next week if that’s ok with you. I’ll send you a link via Facebook once it’s up. Love! I wantes to do this for my wedding centerpieces(purple is the main color). I tried it tonight and it didnt work for me 🙁 i used krylon indooroutdoor purple gloss spraypaint. Any tips i really love this idea and want to use it. This is really cool. I’m gonna try this! I tried this last night for a pinterest party. They turned out sooo well. I couldnt believe how easy i was and how great they came out. Just made these in black. Love them! I will be making several more for gifts! Dont use regular spray paint. Use primer. Otherwise the paint just flakes & peels off. Could you please specify exactly what brand/type of paint/primer you used to get the effect in the pictures? They look almost sandy and I love it! But there are so many options out there, I can’t tell which would be best, so I figured I’d ask! These are so great, I shared them in our roundup post on the blog!